Designers play with an eclectic mix of quirky patterns and prints for spring. Stylist: Mindi Smith/Sarah Laird & Good Company; Hair and makeup: Vivi Lapidus/Tricia Joyce Inc.
Neve Hawk dress worn over The Mini Classy jumpsuit, Tia Cibani necklaces, Mini Rodini hat, Birkenstock sandals; Wolf & Rita top and pants, Tia Cibani vest, Cienta shoes; Mini Shatsu jacket, Molo tee, Tia Cibani shorts, Cienta shoes. 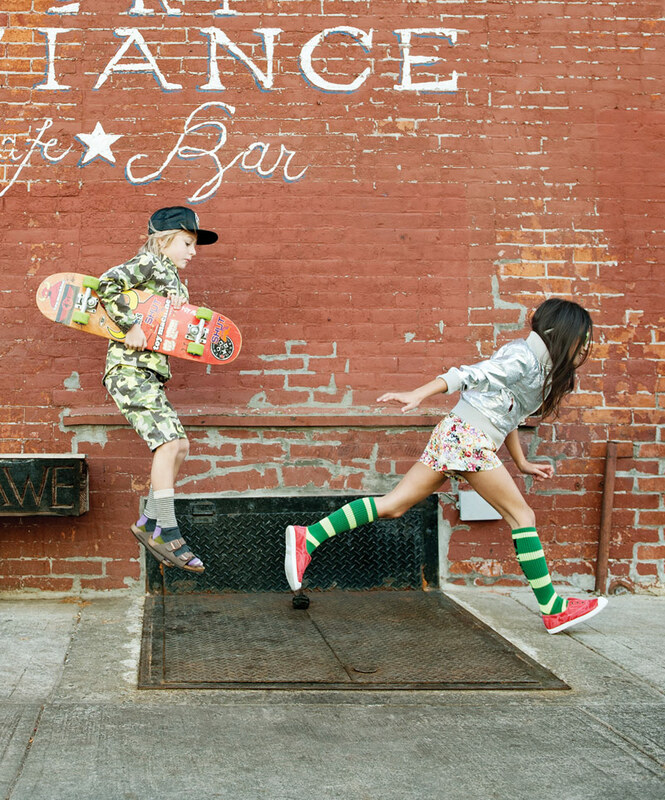 Molo camo button-down and shorts, Someday Soon baseball cap, Happy Socks socks, Birkenstock sandals; Appaman jacket, Derhy Kids jumper, stylist’s own socks, Cienta shoes. 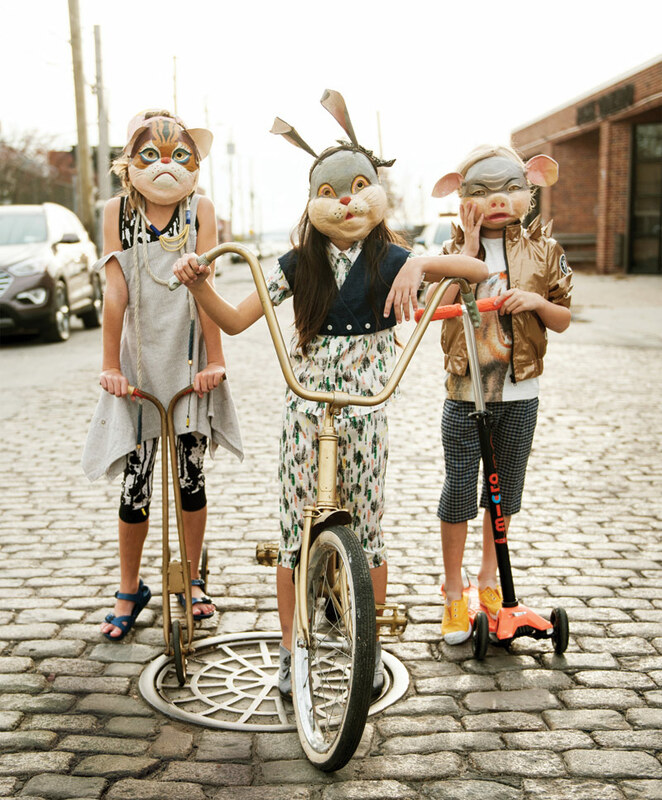 Bang Bang Copenhagen dress, Happy Socks knee-highs, Birkenstock sandals, stylist’s headdress. 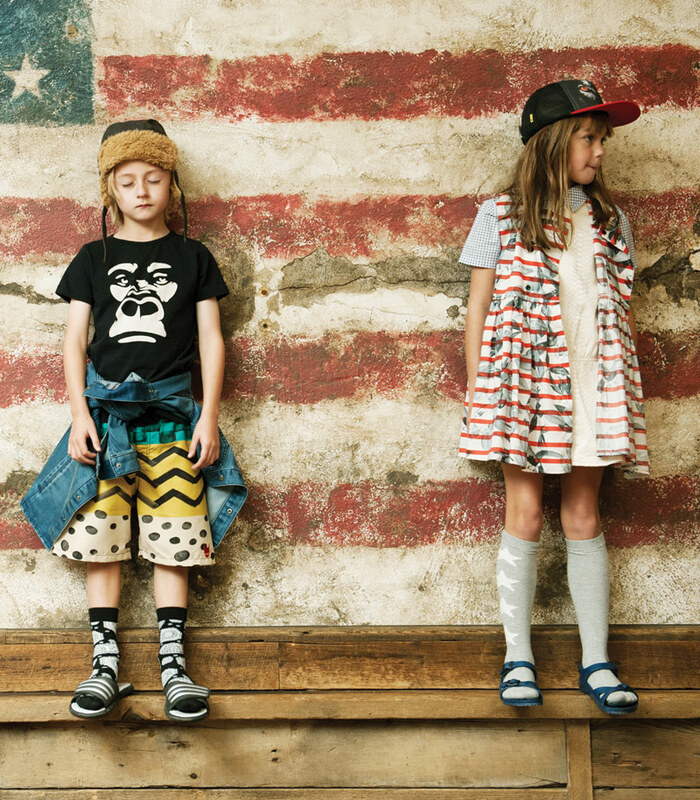 Yporque tee, Sudo denim button-down worn around waist, Munster Kids swim trunks, Happy Socks knee-highs, Adidas slides, stylist’s own hat; Wolf & Rita dress, Sudo shirt, Molo socks and hat, Birkenstock sandals. Anthem of the Ants top, Appaman shorts and socks, Cienta shoes, Siaomimi mask; Munster Kids sweatshirt, Tumble ’N Dry jeans, and socks, Cienta shoes, Munster Kids hat. Soft Gallery jacket and leggings, Molo tee, socks and sunglasses, Birkenstock sandals. 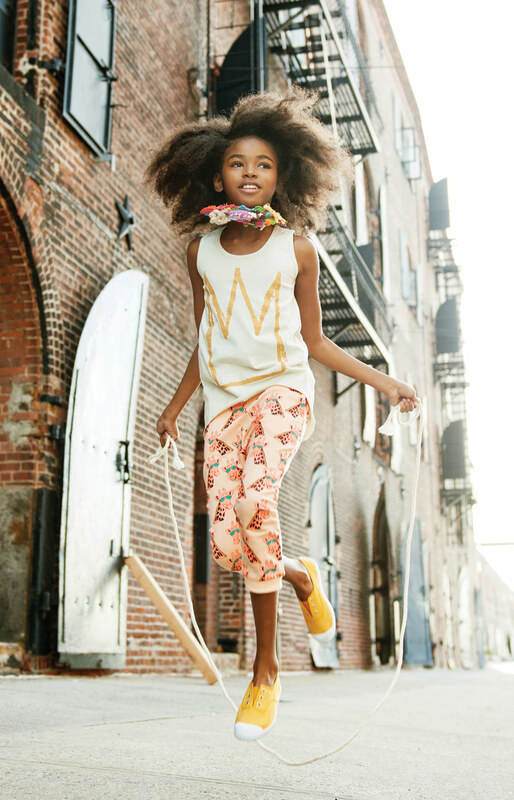 Munster Kids tee, Gardner and the Gang pants, Lemon Loves Lime necklaces, Cienta shoes. Sudo dress, stylist’s own socks, Vans sneakers; Mini Rodini jacket, Tia Cibani shorts, Someday Soon raccoon-tail keychain, Cienta shoes.